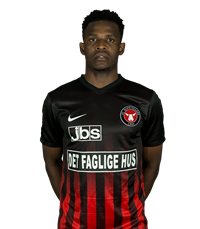 Young Nigerian midfielder Frank Onyeka received the first red card of his career in FC Midtjylland's 2-1 win at Hobro in the Danish Super Liga on Sunday, February 25. Prior to today's game at DS Arena, Onyeka had seen his profile rise with two goals in his last two games in the division against AC Horsens and FC Copenhagen and manager Jess Thorup had no choice but to include him in the starting line-up aganst Hobro. Sixteen minutes into the game, the midfielder was yellow carded for a tackle on Frans Dhia Putros, and got sent off for a second bookable offense in the 62nd minute. Two minutes before the Nigerian took the walk of shame, he almost provided an assist for Mads Døhr Thychosen, but Hobro goalkeeper Jesper Rask made a brilliant save. Onyeka is considered an utility player as he can be deployed as a central defender, central midfielder, defensive midfielder or winger, and started in attack in today's match against Hobro. Hailed as the New N'Golo Kante by the official website of FC Midtjylland , the 20-year-old spent his formative years as a footballer with cooperative club, FC Ebedei before his arrival at Midtjylland's football academy in January 2016.